Rainboth, W. J. 1991. 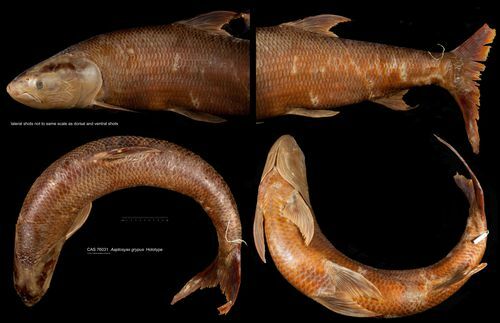 Aaptosyax grypus, a new genus and species of large piscivorous cyprinids from the middle Mekong River. 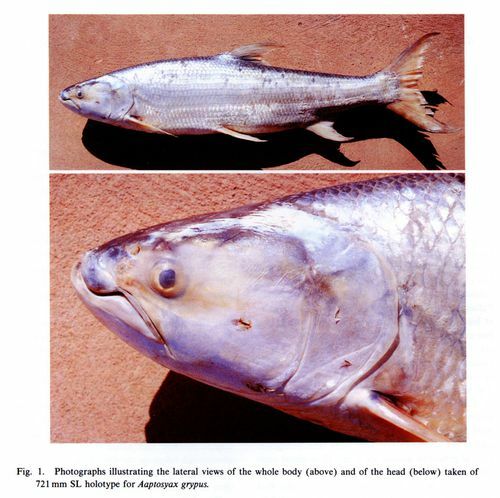 Japanese Journal of Ichthyology 38(3): 231-237. Pa sanak gnai in language. Baird, I.G. (1998) Preliminary fishery stock assessment results from Ban Hang Khone, Khong District, Champasak Province, Southern Lao PDR. : Technical Report. Center for Protected Areas and Watershed Management, Department of Forestry, Agriculture and Forestry Division, Champasak Province, Lao, People's Democratic Republic. 112 p.
Roberts, T.R. (1993) Artisanal fisheries and fish ecology below the great waterfalls of the Mekong River in southern Laos. : Nat. Hist. Bull. Siam Soc. 41:31-62. Vidthayanon, C. (2005) Thailand red data: fishes. : Office of Natural Resources and Environmental Policy and Planning, Bangkok, Thailand. 108 p.